Mr. Jacobs teaches middle school Social Studies, 8th grade Homeroom teacher, as well as, Kindergarten through 3rd grade PE. He has a BS in Secondary Education from Indiana University, Bloomington. He became a called teacher in 2014 when he went through the colloquy program through Concordia University of Chicago. 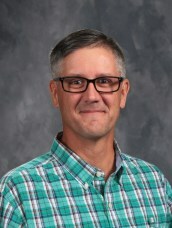 Mr. Jacobs has 14 years of teaching experience and loves reading, traveling, running marathons and half marathons, and spending time with his family. He is married to Stacy and together they have three daughters and a son: Ashley, Abigail, Alaina, and Daniel. He feels very fortunate to teach at a school where he can share the love of Christ with his students every single day.